The kickoff of the 2011 Steel Safari is just a week away, and things are heating up! Temperatures at this long-range field match are always right around 100-degrees, but this year there will be more competitors than ever (38) and a better prize table than ever before. Match organizers expect strong competition this year, as there will be many seasoned Steel Safari “alumni” competing, including recent Steel Safari Top-5 finishers. The Steel Safari takes place this year on June 3rd, 4th, and 5th at the Blue Steel Ranch located near Logan, NM. Zak Smith is the match director. You can learn more about match details and courses of fire at www.SteelSafari.com. A true field match with no “square-range” in sight, competitors may need to use improvised and non-standard shoot positions to make shots. The match showcases practical rifle shooting in the field. Competitors locate small and medium-sized steel targets (often hidden), range them, and engage with one shot only, under a challenging time limit. Some movement on the clock is required, and shoot positions are always improvised, the best you can do while on a reverse incline, over a rock face, shooting down a gully, or leaning out the side of a truck. To add to the challenge, these shooting stations are distributed over two different 3-mile courses in rugged desert terrain. Despite this simple general description, there are a host of individual skills that a competitor must master to place well at this match. Besides being a test of rifle shooting skill, it also stresses rifle and gear setup and reliability, and individual concentration and mettle. After hiking around in the desert for six hours, it takes talent, determination, and good field skills to find six targets out in the terrain, range them accurately, and then quickly make the shot from sometimes very difficult shooting positions. Rugged precision bolt rifles such as this Accuracy International are typical at the Steel Safari. The .260 Remington is one of the most common cartridges in the Winner’s Circle. A variety of rifles, calibers, and scopes will be used at the match, but most competitors employ more or less similar gear. First, an accurate rifle is critical. Bench-rest accuracy is not required; one MOA is sufficient, but one-half-MOA is preferred. Almost everyone shoots their own hand-loads with premium bullets from Sierra, Berger, or Lapua. Ballistic data, or “dope,” completes the triad with the rifle and ammunition. Most shooters laminate a small card and tie it to their rifle or scope, or use a retractable “pathfinder” available from Allison Machine Tool or Leupold. Long-range ballistic data isn’t useful unless the target distances can be determined, and the best tool for that is a laser range-finder. Since many laser range-finders are monocular units with limited field of view, a good set of binoculars can be a life-saver when trying to find that hidden target. 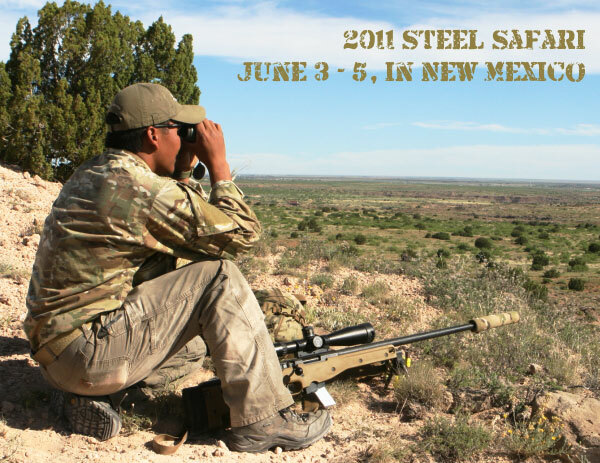 Share the post "Challenging Steel Safari Match in New Mexico, June 3-5"